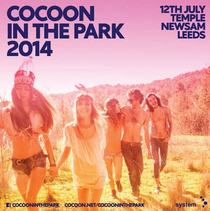 Cocoon in the Park returns to Leeds in 2014 with a bigger, extended line-up of five diverse acts. In true Cocoon tradition Sven Väth will headline the event, alongside support from a line-up including Seth Troxler, Appolonia, Enzo Siragusa and a special guest all across one stage. The picturesque setting of Temple Newsam will once again play host to thousands of music-lovers complimented by state of the art visuals, pyrotecnics and performances from the dancers at Cocoon to transform the backdrop of Temple Newsam into a boutique festival experience. The festival site will be powered by a full Funktion-One, supplied by festival sound specialists Audio-Plus. VIP packages are also available to give clubbers the chance to experience Cocoon In The Park from a raised VIP platform with access to a private bar, toilets and complimentary glasses of champagne. VIPs also have express entry through their own lane to beat the queues and coaches available from Manchester, Liverpool and Newcastle. This year will see an increased capacity with the expected attendance set to top previous years. For ticket information, check: www.cocooninthepark.com.